Friends of the Downs and Avon Gorge (www.fodag.org) and UWE ACE Faculty Staff are seeking student volunteers to help refresh the existing Avon Gorge website and to create a new interactive park app using free app creation software. 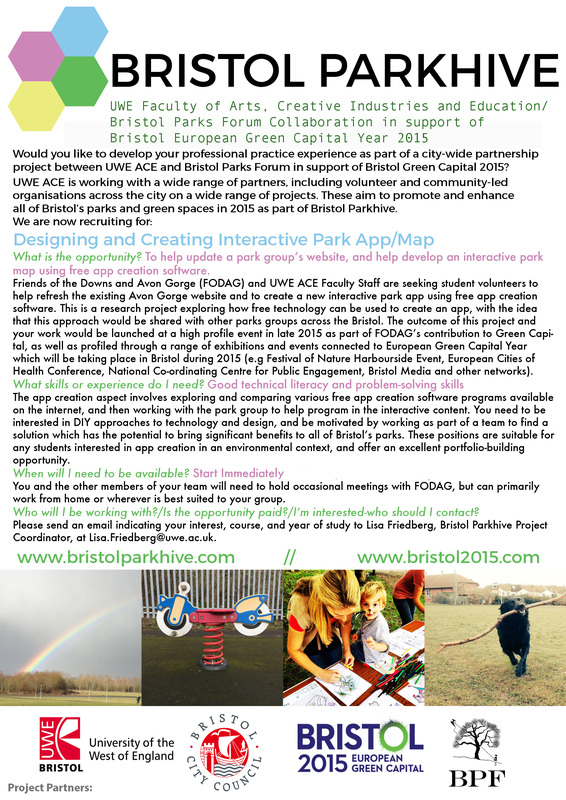 This is a research project exploring how free technology can be used to create an app, with the idea that this approach would be shared with other parks groups across the Bristol. The app creation aspect involves exploring and comparing various free app creation software programs available on the internet, and then working with the park group to help program in the interactive content. 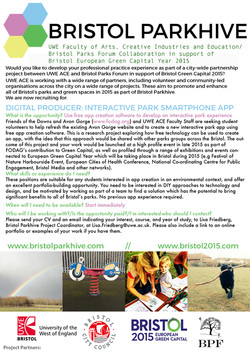 The outcome of this project and your work would be launched at a high profile event in late 2015 as part of FODAG’s contribution to Green Capital, as well as profiled through a range of exhibitions and events connected to European Green Capital Year which will be taking place in Bristol during 2015 (e.g Festival of Nature Harbourside Event, European Cities of Health Conference, National Co-ordinating Centre for Public Engagement, Bristol Media and other networks). Suited for: These positions are suitable for any students interested in app creation in an environmental context, and offer an excellent portfolio-building opportunity. You need to be interested in DIY approaches to technology and design, and be motivated by working as part of a team to find a solution which has the potential to bring significant benefits to all of Bristol’s parks. No previous app experience required. Please send an email indicating your interest, course, and year of study, and CV if appropriate to Lisa Friedberg, Bristol Parkhive Project Coordinator, at Lisa.Friedberg@uwe.ac.uk. Please also include a link to an online portfolio or examples of your work if you have them.